I am participating in an informal book club that is called the Better Yourself Book Club. We read personal development books and get together once a month. Reading about personal development, I have learned that gratitude plays a big part. I probably knew that already on some level…but I don’t always remember to actively practice. I read “The Happiness Advantage” by Shawn Achor separate from the book club in June. I had stumbled upon Shawn Achor’s TEDTalk on YouTube one Saturday morning, and I just thought I would really enjoy his book. And I did. In addition to gratitude, he believes we need to show appreciation to people in our lives (he suggests a daily e-mail to someone praising them for something they have done (directly or indirectly) that has helped you). I love e-mail like the next girl, but I am also a paper card chick. I made a bunch of these note cards (using random scraps of paper, all with the same sentiment) and took them to my most recent book club meeting and gave them away to the other book club attendees. The women of the book club have made MY day at every meeting. And they would be able to tell someone else the same thing with the note card. And this note card is going into the mail this morning. Supplies: Stamp – Stampin’ Up!, paper – background paper – source unknown, Neenah Classic Crest Solar White, Stampin’ Up! Orchid Opulence (retired), ink – VersaMark, die – Spellbinders, embossing powder – Stampin’ Up! Sterling Silver, ribbon – JoAnn’s. 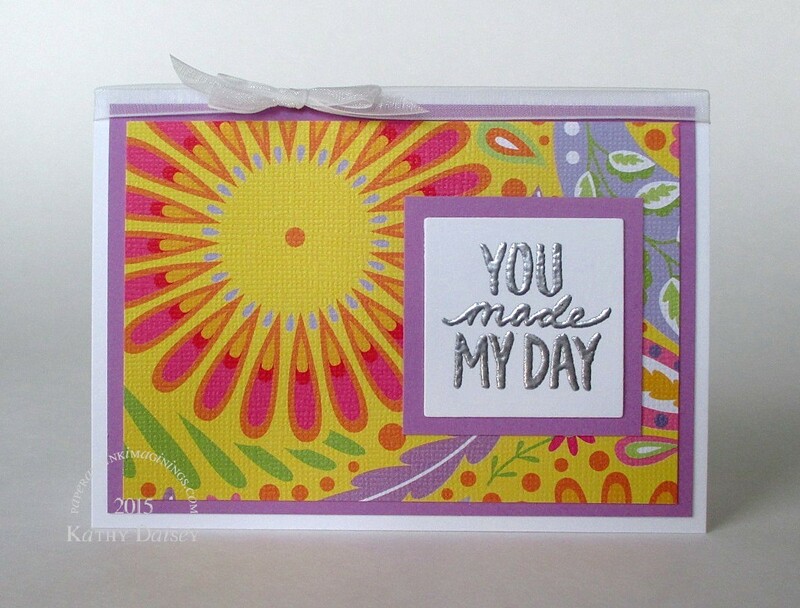 Categories: card, encouragement, thanks | Tags: card, Neenah, Spellbinders, Stampin' Up! | Permalink. Thanks, Lekha! It’s a fun idea, right? Yep, the color composition says it all. You have a great way of communicating through colors. (sheepishly) I must admit, the very colorful paper was something I purchased, not something I created with ink or paint. It is very colorful & happy! Really, well you shouldn’t have mentioned that, no one would ever know. See, I was right about your communication skills, these colors are infectiously happy. I should confess, I shared this link on my facebook page and thanked friends and family with the message on the card. I could not resist. What a cute idea, Lekha! Thank you Kathy, I was worried I crossed a line, because I didn’t get your permission. I was wondering whether to delete it or not. No worries sharing a link to the post. Hopefully, it will make someone else’s day as well!